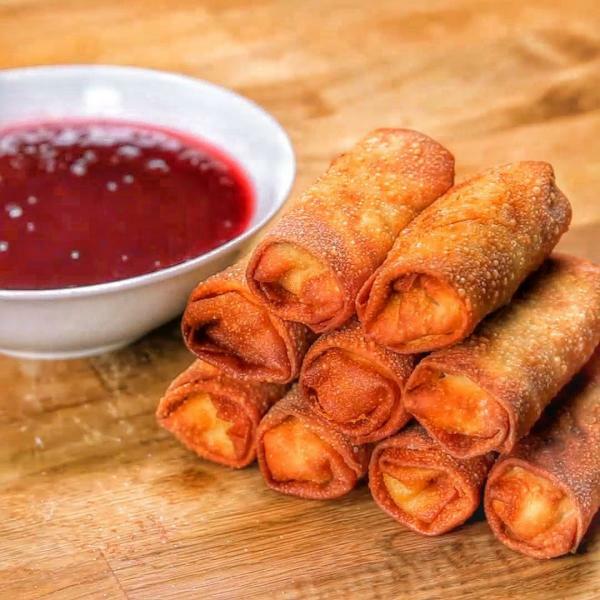 To make the dipping sauce, combing the cranberry sauce, water, orange juice, and orange zest in a microwavable bowl. Microwave for 40 seconds to 1 minute. Carefully strain through a sieve or strainer to remove any clumps or pieces of cranberry. Chill in the refrigerator until ready to serve. In a small bowl, stir together the cornstarch and water. To wrap your egg roll, start with a clean, flat surface. Lay the wrapper so one of the corners is facing you (like a diamond). Dip your fingers in the cornstarch water and spread on each edge of the egg roll wrapper. Then spread 1/2 Tbsp mashed potatoes in the corner closest to you. Top with 1/2 Tbsp stuffing and a few small pieces of turkey. Lift the bottom corner up and begin to roll away from you, making sure you tuck the corner under as you roll. Once you are halfway up the wrapper, fold in the left side and then the right side towards the center. Continue rolling away from you until only the final corner is ready to roll. Dip your fingers in the cornstarch and water mixture you made earlier and brush it over the final corner. Finish the roll, brush a little more of the cornstarch mixture along the seam, and place seam-side down. Make sure you roll the egg rolls tightly. If they are too loose, they will fall apart when you fry them. To fry the egg rolls, fill a pot with 4-5 inches of cooking oil. Heat the oil to 350 degrees. Gently add the egg rolls to the hot oil, frying no more than 3 or 4 at a time, turning occasionally. Fry until the egg rolls are golden brown, approximately 2 minutes. Place on paper towels to drain and cool. 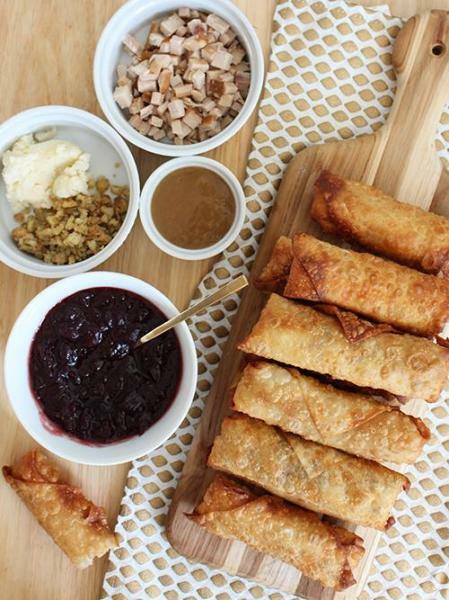 Serve immediately with the cranberry dipping sauce.